Dr. 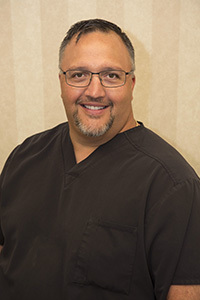 Learn has been practicing dentistry since graduating in 1994 from The University of Pittsburgh School of Dental Medicine. His accomplishments over the past 20 years include being an instructor at the Westmoreland County Community College in the dental hygiene and assisting programs, current advisory board member for the WCCC dental hygiene program, former President of the Westmoreland County Dental Society, and former Co-chair of the Westmoreland County Special Smiles Program. In 2007, Dr. Learn received the most prestigious award from the Academy of General Dentistry, the Lifelong Learning and Service Recognition Award. Dr. Learn was one of the first to receive this award and was the youngest recipient ever. The requirements for this award are to have your Mastership in the Academy, have an additional 500 continuing education credit hours and provide 100 hours in some form of dental community service. The “MAGD” after Dr. Learn’s name designates a Mastership in the Academy of General Dentistry. The MAGD designation is the highest distinction a member can achieve through the continuing education program of the Academy of General Dentistry. Hands on study in 16 dental disciplines and 600 hours of continuing education are necessary for this distinction, in addition to first achieving a Fellowship in the Academy of General Dentistry. Dr. Learn, his wife Jennifer; who is a local Paralegal, and son Brandon currently reside in the New Stanton area. They spend most of their free time traveling to and from sports events with their son’s travel sports teams. 1998 - 2000: President, Westmoreland County Dental Society. 1999 - present: Membership Chairperson; Pennsylvania Academy of General Dentistry. 2003 - 2006: Student Membership chair; Pennsylvania Academy of General Dentistry. 1996 - Present: Clinical Instructor, WCCC Dental Hygiene Clinic. 1996 - Present: Chairperson, Westm'd Cty National Children's Dental Health Month. 1997 - Present: Advisory Board, WCCC Dental Hygiene Program. 2001 - Present: Co-Chair Westmoreland County Special Smiles Program.